I’m A bit late with this sorry! October Foreclosure filings at last seemed to catch up to word of increasing default rates. Foreclosure filings rose from 263 in September to 385 in October, an increase of 46 percent. 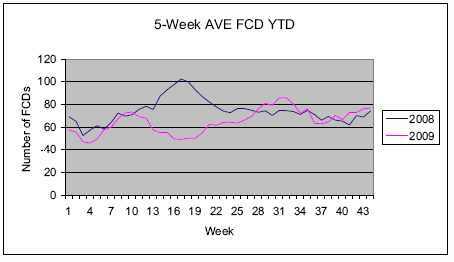 * In fact, foreclosure filings exceeded the previous year in three of the last four months; for the months of July through October, foreclosure filings rose 5 percent compared with the same period in 2008 (see chart below depicting the 5-week average of foreclosures filed in 2008 versus 2009). Foreclosure filings year-to-date in 2009 remain 11 percent below foreclosures filed during the same period in 2008. * NOTE: October was a five-week month. Not so encouraging was the increase in foreclosures over the last four months. Foreclosure filings for the period numbered 1,346, up from 1,277 (or 5 percent) during the same period last year. 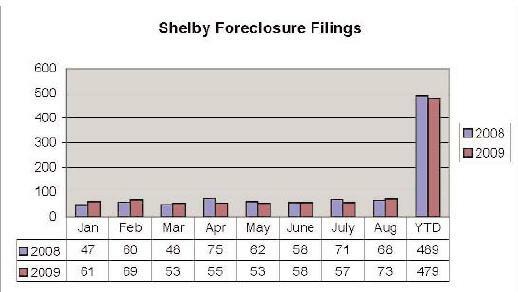 Foreclosure filings in Shelby County nearly doubled from September to October, rising from 36 to 64. * However, Shelby County has not yet experienced the type of rise in foreclosures seen in Jefferson County. Foreclosure filings in Shelby County are down 16 percent as compared with the same period in 2008. 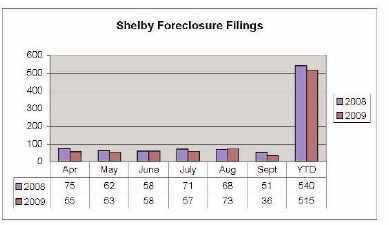 Sixty-four foreclosures were filed in Shelby County in October, up from 26 the previous month. In October of 2008, 90 foreclosures were filed. This entry was posted in Alabama, Birmingham, Foreclosure, Shelby County and tagged Birmingham, Foreclosure, Housing Statistics, Jefferson County, Shelby County on December 16, 2009 by Tom Brander. So this report from Alabama Title Company reflects actual foreclosure deeds filed in the county. Interestingly they paint a considerably brighter picture, which I certainly hope to be a more accurate reflection of what is really happening. Despite recent reports that foreclosures are surging in the state, foreclosures in Jefferson and Shelby counties, as measured by the actual number of foreclosure deeds filed in those Probate offices, continue to decline, by 13 percent for the year in Jefferson County and by five percent in Shelby County. In the mortgage market, Jefferson County saw a marked increase in filings, but the number remained relatively weak compared with 2008. 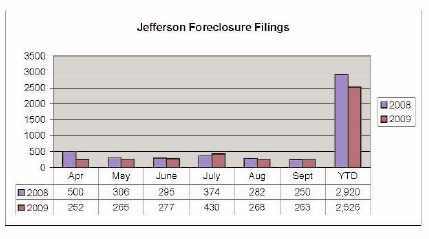 Foreclosure filings in the Jefferson County Probate Office fell to 263 in September from 268 in August. Year-to-date, foreclosures in Jefferson County are down 13 percent compared with the same period in 2008. Foreclosures declined in Shelby County from 73 in August to 36 in September. Overall, foreclosures year-todate are down nearly five percent in that county. This entry was posted in Alabama, Birmingham, Foreclosure, Jefferson County, real estate, Shelby County and tagged Foreclosure, Housing Statistics, Jefferson County, Shelby County on October 30, 2009 by Tom Brander. I am pleased to present what I believe to be the best local foreclosure data. Unlike the national “foreclosure filing” data which represents delinquent loans which may or may not result in an actual foreclosure, that is most often reported, this is real foreclosure data, filed at the courthouse, from actual transactions reported on a consistent basis and timely basis. We were pleased to help Alabama Title with presentation ideas for this data. 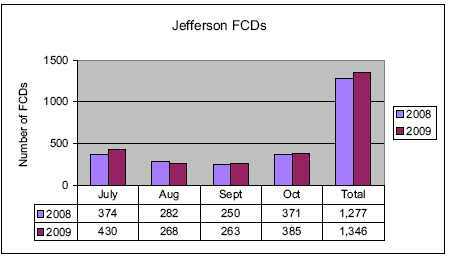 Jefferson County foreclosures rose in July to 430 from 277 the prior month. In August 268 foreclosures were filed. 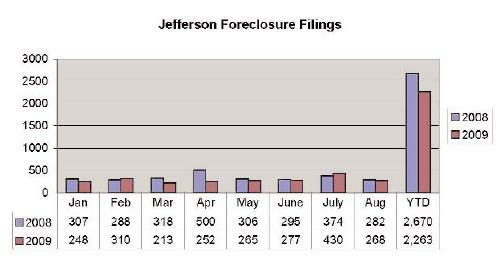 Overall, foreclosures year-to-date are down 15.2 percent in Jefferson County. 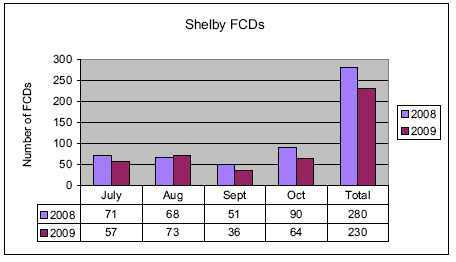 Shelby County: Shelby County foreclosures jumped from 57 in July to 73 in August. However, year-todate foreclosures are down slightly by two percent. 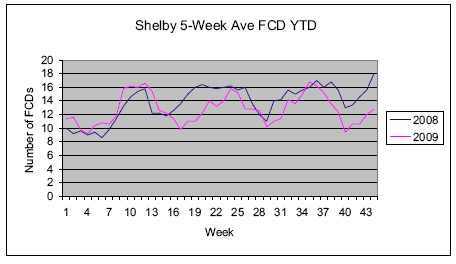 Generally, Shelby County foreclosure numbers have remained more stable than those of Jefferson County. Despite a mini-surge in foreclosures in Jefferson County in early August, the real news for the month is the continued decline of mortgage activity. Despite a short boom in refinances during the first quarter of the year, mortgage filings fell to their lowest level since December 2008, when credit markets faltered after a series of large corporate failures. Mortgage filings typically decrease in the Fall reflecting the seasonality of the housing market. However, the steep decline over last year’s numbers – absent a decrease in interest rates such as occurred last December – does not bode well for the mortgage market. This entry was posted in Alabama, Foreclosure, Jefferson County, Shelby County and tagged Foreclosure, Jefferson County, Shelby County, Statistics on September 25, 2009 by Tom Brander. Birmingham home sales tanked in January – Birmingham Business Journal:. This report Via the Birmingham Business Journal from The MLS, Our report will be out this next Monday, our figures will differ slightly as we give the agents more time to enter transactions. Interesting note on Forclosure sales. The Full BAR report is on their site. This entry was posted in Alabama, Birmingham, Foreclosure, MLS, Monthly comments, real estate and tagged Alabama, Birmingham, Birmingham Alabama, Birmingham Business Journal, MLS, Monthly comments on February 10, 2009 by Tom Brander. As we approach the midpoint of the year, investors begin to reflect on what happened during “the first half” — where we stand, and where we’re going. If I had to encapsulate what Collins’ 2007 has consisted of thus far, it would have to be “digesting”. The Collins Group had an extremely active 2006: over $400 million in new assets including our $132-million deal which was one of the largest multifamily deals in Alabama (or at least one the largest Capmark’s Chad Hagwood said he had seen that year) and our year end $155-million buy which established us as one of Alabama’s largest landlords. Deals like these take time to digest and to absorb into a diverse portfolio. In addition, some of our earlier deals are coming out of lockouts. Collins Group hopes to refinance as much as $500-million in floating rate debt in 2007 so we can poise ourselves for another round of aggressive expansion. We remain bullish on the Southeast, we still see the markets in the region as being solid long-term investment areas. Our relationships with our preferred lenders — industry leaders like GE Capital, Wachovia, Capmark Financial Group, among others — continue to strengthen and improve. And if markets like Atlanta are expected to outpace the nation in population growth until 2020, we might not be going anywhere for a while. I have begun to aggregate some of our press and news using the social bookmarking site, del.icio.us, in order to give our readers some of an idea as to what the press is saying about the Collins Group, and where we have been active in the recent past with regard to our acquisition and expansion activity. In a partnership with New Jersey-based Lightstone Group, Collins purchased the portfolio from the Florida-based Landmark Properties Trust. The Birmingham office of CapMark Financial Group (formerly GMAC Commercial Mortgage) provided financing. Park Avenue Funding of New York City participated as an equity partner. Birmingham-area Hinton Properties and Engel Realty acted as brokers. Collins’ Alabama portfolio currently stands at 5,000 units, with a gross value in excess of $300 million. These are outstanding communities in the strongest markets in the area. Collins owns properties literally next door and across the street from these communities which have been shown themselves to be prime and pristine assets. The portfolio marks Collins’ ninth Alabama acquisition. “The Birmingham market is seeing strong occupancies and, with a moratorium on new additions, this is only expected to remain the case,” remarked Finance and Acquisition VP Jay Herman. We remain focused on Birmingham. Thirteen consecutive quarters of steady rent growth attest to this market’s viability. Collins’ regional expansion plans are not expected to slow down. By the end of this year, Collins’ Alabama portfolio will total some 8,000 units with a gross value of over $500 million. Collins has several acquisitions pending for the third and fourth quarters of 2006. Collins has found numerous opportunities in Alabama in line with our philosophy of seeking assets with intrinsic value in its acquisitions. The properties – Renaissance at Galleria, Park at Galleria, Place at Galleria, Overlook at Homewood, Magnolia Park at Homewood, and Wisteria Park – have benefited from significant improvements since upgrades began in 2002. Over $17 million has gone into improving the properties, with two properties – Overlook at Homewood and Magnolia Park – receiving full exterior and interior overhauls completed in winter 2006. The properties feature some of the most luxurious amenities in the Birmingham area. Collins has partnered with The Lightstone Group in other ventures, including the 672-unit highrise Marbury Plaza in Washington, DC. Lightstone sets the pace for aggressive growth while giving attention to the details of building value. Lightstone brings a lot of things to the table – their strong reputation in the marketplace, their extensive financial experience is a perfect synergy with Collins’ attention to detail on the management side. “Collins is pleased with its new alliance with CapMark in its financial ventures. Collins is certain CapMark was the right choice,” added Herman. Collins and CapMark are already working closely on pending acquisitions. The Collins Group remains committed to its corporate philosophy: providing quality tenant services by upgrading assets and providing excellent and attentive management. This entry was posted in Alabama, Birmingham, Foreclosure and tagged Alabama, apartments, Birmingham, Collins Group, Foreclosure, Rental on January 27, 2009 by Tom Brander.